Phaser technology, a combination of the words phosphor and laser, is based on blue beams of light focused on a phosphor converter to produce white light of exceptionally high luminance. "We are very much looking forward to receiving the award for the Itos Phaser 3000 from R&D Magazine as one of the most innovative technical products of the year. Thanks to new technology, this light source provides much more intense illumination than before," according to Hans-Joachim Schwabe, CEO of the Special Lighting division at Osram. To ensure optimum results from close-up work in industrial and production facilities the illumination needs to be as bright and as homogeneous as possible, and that is precisely what the Itos Phaser 3000 provides. What’s more, this phaser generates less heat than the xenon lamps previously used for such applications so much less cooling is required. Applications are not restricted to the industrial sector, however. 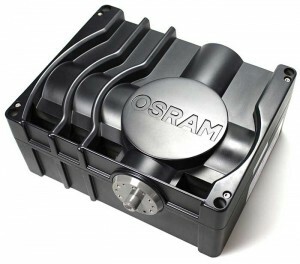 This light module from Osram can also be used in microscopes and endoscopes. The US R&D Magazine presents the "R&D 100 Awards" to the 100 most significant developments to come onto the market in the last year. The winning products come from a wide range of sectors, including telecommunications, material sciences, chemical engineering and biotechnology. The awards have been presented each year since 1963 and are highly respected in all branches of technology. In picture: Osram’s Itos Phaser 3000.